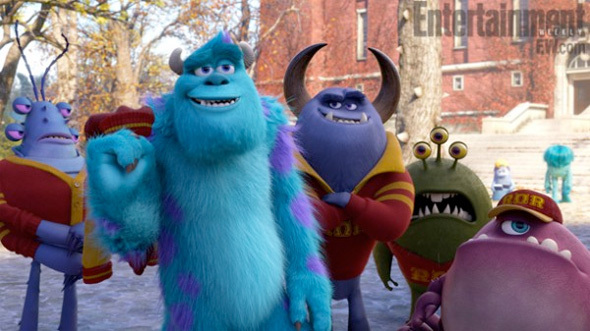 Well, it sounds like the full voice cast for Monsters University wasn't entirely revealed. Despite including the voices of Billy Crystal, John Goodman, Steve Buscemi, Helen Mirren, Dave Foley, Sean Hayes, Joel Murray, Peter Sohn, Aubrey Plaza, Tyler Labine, Bobby Moynihan, Julie Sweeney, Alfred Molina, Beth Behrs, and John Ratzenberger, there are three more names that have just surfaced. 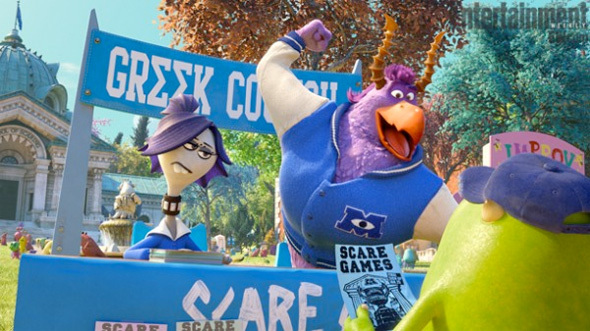 Nathan Fillion is playing a horned monster from Roar Omega Roar named Johnny Worthington (see a new image below), John Krasinski is playing Frightening Frank McCay, a scaring superstar, and Bonnie Hunt (Cars) is voicing Mike Wazowski's grade school teacher Karen Graves. Look! Pixar's Monsters University is being directed by Dan Scanlon, who went from animator to storyboard artist to writer to co-director on Mater and the Ghostlight, making his feature directorial debut. This is a prequel to Pixar's animated movie Monsters Inc, originally released in November of 2001. Disney has Monsters University scheduled for release in Digital 3D everywhere June 21st, 2013 this summer. Visit: MU.com.